Studying to become a Financial Planner is taking up a lot of my time. It’s rewarding and interesting as personal finance is a hobby of mine as much as game design. While I would love to continue to do both, only one is going to allow me to pay the bills. This blog, and game design in general is not the one I can continue with. I wont remove the blog or the posts. Please feel free to link to them, comment on them, email me. I want to be engaged in the conversation about games and game design, I just can’t devote a lot of time to it lately. So to keep you entertained here are some statics about my blog. From April 2011 to now I almost 20,000 Pageviews. That accumulated about $110 until I turned off Ad Sense earlier this month. Most of that was from a few kind folks who clicked on ads while visiting the site. If you did, thank you! I’m going to buy a new monitor because this one is going to stop working very shortly. 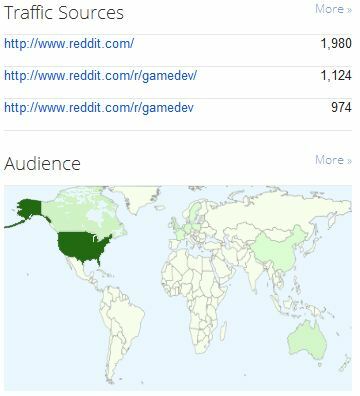 Most folks found my blog from my posts on Reddit. Which is a really great place to drive traffic from. There are many ways to suggest to Reddit viewers that they check out your page. My suggestions are pretty blunt methods. But you should check them out if you want to drive traffic to your blog. Finally here is a list of my most popular posts. If you want to keep reading about game development and gaming in general I highly recommend checking out Technomancer’s Blog, lightspeedgaming. He’s starting to build up a good blog there, and has some interesting things to say. I hope you learned something about game design. Hopefully this blog continues to be a resources for you. I hope you had a good time. And I hope someday to be able to post back here about games and game design. But until then, I am super busy learning the ropes of a new game; Financial Planning. I wish you the best of luck with your work and hope that you'll find some time eventually to make a post here and there. Thanks for a lot of interesting posts! Thank you, I appreciate that! I'll be following your blog, so make some great posts!